Irritable bowel syndrome (IBS) is a disorder that affects your large intestine and causes symptoms such as abdominal pain, cramping, diarrhea, gas, bloating and constipation. You need to take special steps to grapple with this chronic condition as most treatment options will only help relieve symptoms for a short time. However, you can make certain lifestyle changes and adjust your diet to lead a normal life. There are a number of diet plans nowadays, but it is always suggested to consult your dietitian before you switch to an IBS diet. You can make your symptoms manageable by switching to a high fiber diet, especially if constipation is your main concern. The most important thing is that sometimes an increase in dietary fiber doesn't suit a patient at the first time. Therefore, it is important that you increase fiber intake gradually, opt for a variety of fibers, and drink no less than 1.5liters of fluids a day to know if it works in your case or not. You need to avoid taking large meals, as they often aggravate IBS symptoms. Whatever IBS diet you're following, it is a good idea to spread it over three meals and three snacks a day. Don't eat quickly and be sure to exercise regularly to keep your symptoms in check. What Can Be Added in IBS Diet? When trying to figure the best irritable bowel syndrome diet, you need to bear in mind that anything that's gentle on your digestive system will work just fine. You can find so many food options that won't put pressure on your digestive system and even encourage "smooth passage" through your intestines. Here are a few foods you can add to your IBS diet. You should include soluble fiber in your diet because it dissolves in water and changes into a kind of gummy consistency that is good for your digestive tract. Some of the best foods containing soluble fiber include parsnip, winter squash, sweet potatoes, turnips, okra, green peas, barely, oranges, tangerines, grapefruit, oats, bananas, ground flaxseed and berries. 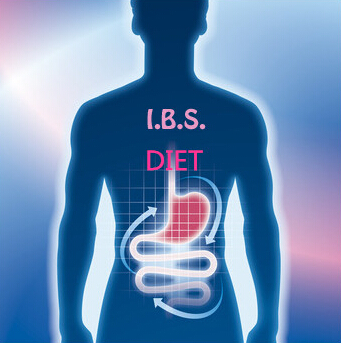 A lowfat diet for IBS is beneficial for IBS and for your heart as well. You should eliminate animal fats and dried foods from your diet or at least limit their intake and replace them with fruits, lean meat, grains, vegetables and low-fat dairy products. The good bacteria in probiotics have proved to be beneficial for someone suffering from irritable bowel syndrome. Although they don't work for everyone, the good bacteria in probiotics can outnumber bad bacteria and encourage a healthier gut environment. This in turn will help with digestion and improve symptoms of bloating, wind and diarrhea. Yogurt is one great choice. This is self-explanatory actually. You should eat fiber to control your symptoms, but fiber needs water to do its job properly. You should be drinking at least 8 cups of water a day. You may also consider including other fluids such as sugar-free squash and herbal teas in your IBS diet. Many experts are of the view that the low FODMAP diet can play a role in improving IBS symptoms. FODMAP refers to fermentable, oligo, di, mono-saccharides and polyols. These are basically a group of short-chain carbs that your small intestine cannot absorb completely. You need to limit their intake. You may want to check here to get more information on high and low FODMAP. What Should Be Avoided in IBS Diet? You need to realize that everything you eat will affect your IBS symptoms. It is important to understand what to eat, but it is equally significant to know what foods to avoid. It is a good idea to try a food every day to determine exactly what works in your case and what doesn't. Here are a few foods you need to avoid because they often trigger IBS symptoms. Many IBS sufferers cannot tolerate milk and dairy. It is suggested avoid cheese, yogurt, sour cream, cottage cheese, frozen yogurt, ice cream and prepared food that may contain dairy like pudding, mashed potatoes, sauces, etc. Insoluble fiber keeps food from taking a gooey form, which makes it difficult for the large intestine to handle it. Some foods that are high in insoluble fiber include whole wheat pasta, high-fiber breads, high-fiber breakfast cereals and wheat bran. If your stomach gets upset soon after you eat a salad, nibble crudités or a steamed broccoli, your body isn't tolerating raw veggies. You should avoid raw and cruciferous veggies such as cabbage, cauliflower, broccoli, and Brussels sprouts to avoid making your IBS symptoms serious. IBS sufferers find it difficult to digest compounds in wheat or wheat flour that contains gluten. You may want to avoid foods such as crackers, whole wheat breads, cereals, pasta and baked goods to improve your condition. Sugar and spice don't sit well with IBS sufferers, so it's a good idea to avoid fruit juice, honey, agave, dried fruit and high fructose corn syrup. You may also have to limit the intake of sugar alcohol sweeteners like malitol, sorbitol and mannitol. Any spicy foods or products should be totally avoided. Your symptoms may aggravate if your IBS diet includes beans and lentils becauseeating these may also cause bloating, cramping and diarrhea. Allium veggies may hurt your digestive tract and aggravate IBS symptoms, so it's better to switch to milder ingredients such as fresh herbs, olive oil and some sauces. Having an alcoholic drink or anything fizzy with bubbles may make you feel gassy. To control IBS symptoms, you should avoid carbonated drinks such as soda and seltzer and limit the intake of sparkling wines. Also, say no to caffeinated teas, coffee and soft drinks. Fatty foods are hard to digest, so you should avoid French fries, fried fish and fried chicken. You should also eliminate red meat, including hamburgers, steaks, cold cuts, hot dogsand sausages from your diet. Chocolate may not be the best of your friends if you have irritable bowel syndrome. Avoid all types of chocolates, specifically dark chocolate, to control your IBS symptoms. Some condiments may trigger IBS symptoms, and the most common offenders include pickle relish, ketchup, chutney, soy sauce and barbecue sauce. Avoid them! Why Is Sodium Bad for You and How Much Is Needed? How to Get Rid of Pinworms? Want to Poop but Couldn't, Why? Why Does Your Toddler Vomit During Night? What Causes the Bubbling Sensation in My Stomach? What Causes Tight Feeling in Stomach?